“You might as well write an article about Narnia”, said a friend from Baku sardonically referring to the popular fantasy book series when I turned for help as I rolled my sleeves for writing about contemporary Azerbaijani cinema. Had I posed this question 30 years ago, however, it is likely I would have received quite different answers. Why? Because Azerbaijani cinematography was much richer, more active and alive then than it is now. But it is not just the movie industry that is in relatively poor shape. The state of Azerbaijani TV overall deteriorated as well in the course of the last two decades. It is difficult to blame the economy: Azerbaijan is growing fast and is getting richer so channeling investment into the movie industry, TV industry and generating better content should not be such a big problem. So why, then, is Azerbaijan experiencing a TV and movie black hole? The earliest film shot in Azerbaijan, “The Oil Gush Fire in Bibiheybat ” by Alexandre Michon, dates back to 1898, just three years after the Lumière brothers shot their first film with the cinématographe. Michon was the first foreign director who made several films about Azerbaijan. It was his work that ignited Azerbaijan’s cinematography. In the early 20th century, several documentary films were made depicting Baku’s oil fields, refineries and work at the oil refineries, mostly focusing on the Soviet propaganda. Local productions started with “In the Kingdom of Oil and Millions” (1915) by Boris Svetlov. Based on the motifs of a popular operetta of the time, Svetlov shot in 1916 the musical comedy “Arshin mal alan ” (The cloth peddler), originally a silent movie with the musical parts performed in a studio and female roles played by male actors. The film was re-made in 1945, obtaining a huge success, and then again in 1965 (see this same excerpt from the 1945 version and from the 1965 version ). By the 1920s, Azerbaijan established its first Photo-Film Department. Some of the common themes of the Azerbaijan cinematography then were prejudice, woman's freedom, struggle against ignorance, oil production. In 1935, B.V.Barnet directed the country’s first sound film, “On the Shores of a Blue Sea”. 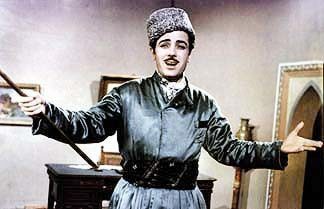 In 1960, Azerbaijan saw its first wide screen color film on the folk legend - “Koroglu” - a lone warrior-hero fighting the foreign invaders and saving his homeland. Despite a relative stall in film production, between then and now, Azerbaijan celebrated the 110th anniversary of cinema in 2008. A year earlier, late President of Azerbaijan, Heydar Aliyev signed a decree [AZ] whereby assigning the Ministry of Culture and Tourism to provide necessary financial and technological support to “AzerbaijanFilm” studio (the successor to Azerbaijan Photo-Film Department); re- establish movie theatres network and renovate existing cinemas. The decree also urged the Ministry of Education to focus on educational prospects promoting and teaching the art of film making in the country. Azerbaijan’s film century came to a halt with independence and the difficulties of Azerbaijani newly formed republic. The overall state of TV and movie is still bleak, 20 years after the fall of the USSR. The most significant international success from these years was “Burnt by the Sun” (1994), which won the Grand Prix by the jury at Cannes and an Oscar as best “foreign language film”, directed by Nikita Mikhalkov and co-writetten by Azeri author Rustam Imbrahimbeyov. As of today, few producers are ready to invest personally in films, as revenues generated from movie theatre screenings and DVD sales not even remotely cover all of the production expenses, let alone generate sufficient revenues. There is also an issue of professional cadres as well as lagging behind in knowledge and technology of modern-day film making. The country’s TV industry is in no better shape. Local TVs show proudly cheesy talk shows ranging from public dating spectacles to poorly prepared debate programs. Khalisa, a local resident from Baku, says “Television channels are terrible. There is one or two debate shows. But they are of poor quality and do nothing more than preach prejudice and further instill ignorance”. Another resident, Sabir, maintains “there is no TV culture in Azerbaijan whatsoever”. Another respondent told me he hadn’t watched local TVs in over eight years. All of the foreign TV series, including the popular Turkish ones, were taken off air as of May 2012, ostensibly in an effort to support local film and TV industry . According to reports , it might have been not only for the industry sake, but also “to protect moral values” of the viewers at large. As of now, Azerbaijan has three state owned channels, one public channel and seven privately owned television channels. Those who can afford it, watch cable TV at home. Whether it was done for supporting the local film and TV industry or to protect moral values, this didn’t concern many of the housewives who followed foreign TV series, and especially Turkish ones. There was nobody to protest, however; rather than question the government and local broadcasting companies, most of the households turned to cable packages that offer access to most of the popular Turkish TV channels. Housewives were reunited with their favorite shows, government satisfied with the ban, life continued by its normal pace. Whether it is the country’s movie industry or TV, both are facing tough times. A complete makeover is a must for the local TV industry, but whether it will happen is a question that remains to be answered. As to Azerbaijan’s 100 something old cinema history, there is still some hope especially as a younger generation of talented and professional directors and producers steps up and takes over, just as we saw with Ilqar Safat winning the Gold Award at the 2011 California Film Awards Ceremony with “Precinct”; or Ilgar Najaf winning at the 5th Ceremony of Asia Pacific Screen Awards with his film “Buta” in 2011; or Shamil Aliyev being honored with diploma in “Special Mentions” nominations of the Philadelphia Documentary and Fiction Festival in the US with his film “Trace of Fortress” (Iz Qala) in 2012; and with hopefully many others to come.